I was raised on spanakopita or a variation thereof from a week kiddie. Something that strikes me as a little strange when I think about it, given the lack of multiculturalism in suburban Melbourne in the early 70’s. There was a goodly sized Greek community in Melbourne even then but we didn’t have any personal links. Except for spanakopita. Here is my most typical version. Not exactly traditional, just the way I most often make it. Combine everything except pastry and butter well. Make a log of silverbeet mix down the centre of the filo. Fold pastry up sides and over top. Yum!! About time we made something similar, I lurve spanakopita. And we have a forest of silverbeet. I love spanakopita, but for me it’s always been spinach and rice. Who knew there were such variations? I’m excited to try yours! Em I think spanakopita is compulsory in spring for gardeners. Fig rice sounds like a god addition. I might have to work that in. Any silverbeet recipe is good right now! Interesting. I met silverbeet for the first time when I moved to NZ. 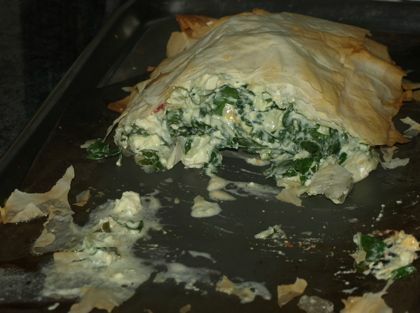 Now, back in Canada, I do a real local bend to the spanakopita each spring by making it with stinging nettle. Sounds good HDR. I’m sure there must be some nettles growing around our creek. I just haven’t found them yet. But I haven’t given up. That’s a great variation on spanakopita. Do you think you could add some lemon zest as well? Definitely Nate, the zest would be delicious in there. I might add some next time in fact.